QED Foundation has been creating opportunities for all since 1990. We believe that people of every race and faith should be able to fulfil their potential. Our aim is to help to build a peaceful and cohesive society where everyone can contribute and be rewarded for his or her efforts. We do this by supporting ethnic minorities to find jobs and progress in their careers. 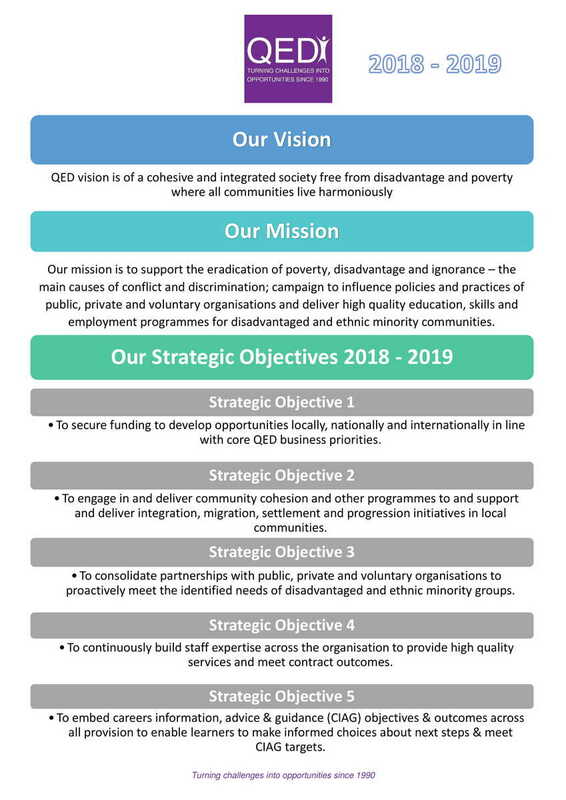 QED Foundation delivers education, training and employment services to disadvantaged communities at neighbourhood level. We enable them to achieve better health outcomes and play a more active role in wider society. But we also support government and public sector organisations, businesses and charities across the UK to tackle inequality. We use our first-hand experience of working at grass-roots level to advise key decision makers. And we promote a positive image of Britain's BME communities and celebrate their successes. Working together we can put ethnic minority issues at the heart of public policy and open up opportunities for everyone.